Tip: On December 14, 2017, the peak morning of the shower, the waning crescent moon will be sweeping past the bright planet Jupiter. If you had to pick one night for watching the 2017 Geminid meteor shower, it’d probably be December 13 (morning of December 14). The nights before and after should be good as well. On a dark, moonless night, the Geminids are known to produce 50-120 meteors per hour, or nearly 1-2 meteors per minute. This year, with the Geminids’ parent object – 3200 Phaethon – nearby, you might see more. Plus, the moon is in a waning crescent phase for this year’s shower; it won’t interfere, and it’ll be passing some predawn planets. 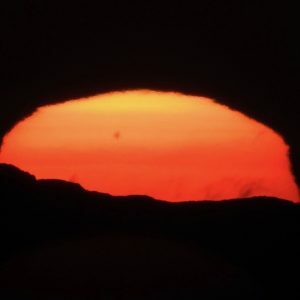 You’ll find EarthSky’s top 10 tips for watching this shower below. 1. Watch late night to dawn. 2. Get away from city lights. 3. Give yourself a wide-open view of the sky. 4. Watch for an hour or more. 5. Don’t worry about the radiant point. 6. Watch for the moon and planets before dawn. 7. Think about the Geminids’ parent object. 8. Bring along a buddy. 9. Special equipment? Not necessary. Best gift for sky lovers? EarthSky moon calendar for 2018. Click here. 1. Watch late night to dawn. Geminid meteors numbers tend to intensify as evening deepens into late night, with greatest numbers of Geminids likely falling an hour or two after midnight, when the meteor shower’s radiant point appears highest in the sky as seen from around the globe. That time hold true no matter your time zone. 2. Get away from city lights. For optimum viewing, find a place to observe in the country. 3. Give yourself a wide-open view of the sky. A farmer’s field? A stretch of country road? A campsite with a clear view in one or more directions? 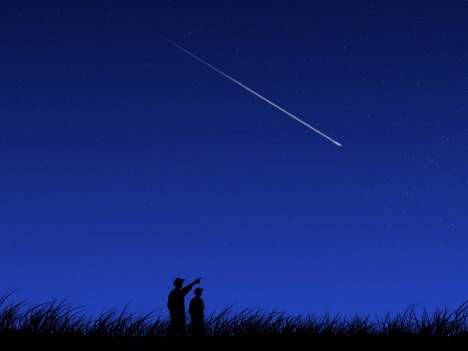 An open sky will increase your chances of seeing some meteors. 4. Watch for an hour or more. The 2017 Geminid meteor shower will be better if you let your eyes adapt to the dark. That can take as long as 20 minutes. Plus the meteors tend to come in spurts, followed by lulls. Be patient! You’ll see some. 5. Don’t worry about the radiant point. You don’t need to look in a single direction – or locate the Geminid’s radiant point – to have fun watching the shower. The meteors will appear all over the sky! The radiant point is interesting, though. If you track Geminid meteors backwards on the sky’s dome, you’ll find them streaming from this point, within the constellation Gemini the Twins. Hence this shower’s name. 6. Watch for the moon and planets before dawn. 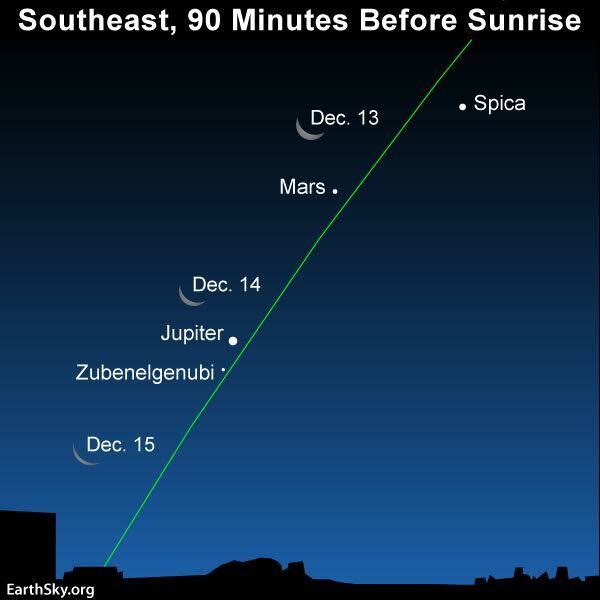 In 2017, the waning crescent moon will be sweeping past the planets Jupiter and Mars in the east before sunup, on the nights around the shower’s peak. See the chart below. The waning crescent moon will slide past the morning planets, on the peak mornings on the 2017 Geminid shower. Notice Jupiter. It’ll be in the same binocular field of view with the star Zubenelgenubi in the constellation Libra the Scales. Look closely, and you’ll see that Zubenelgenubi is a double star – two stars in one! Click here for EarthSky’s planet guide. Steven A. 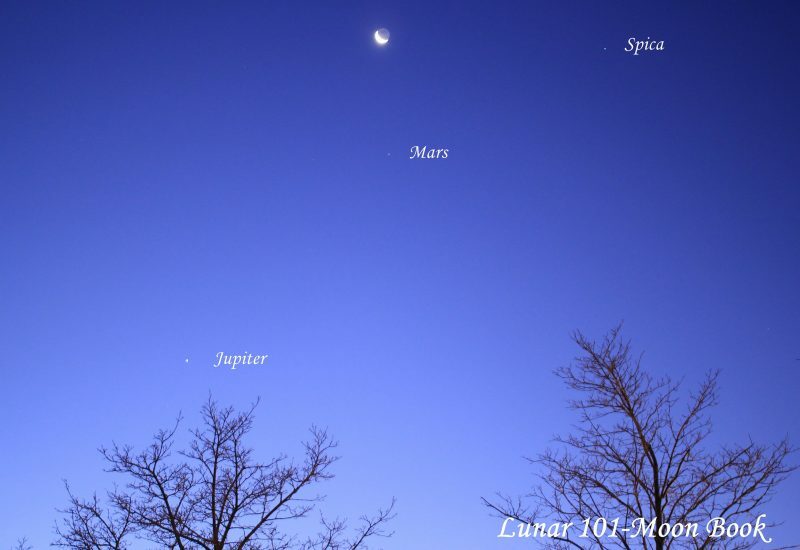 Sweet in Toronto caught the moon and planets on the morning of December 13, 2017. Visit Steven’s Facebook page Lunar 101 Moon Book. 7. Think about the Geminids’ parent object. Most meteors in annual showers originate in comets. 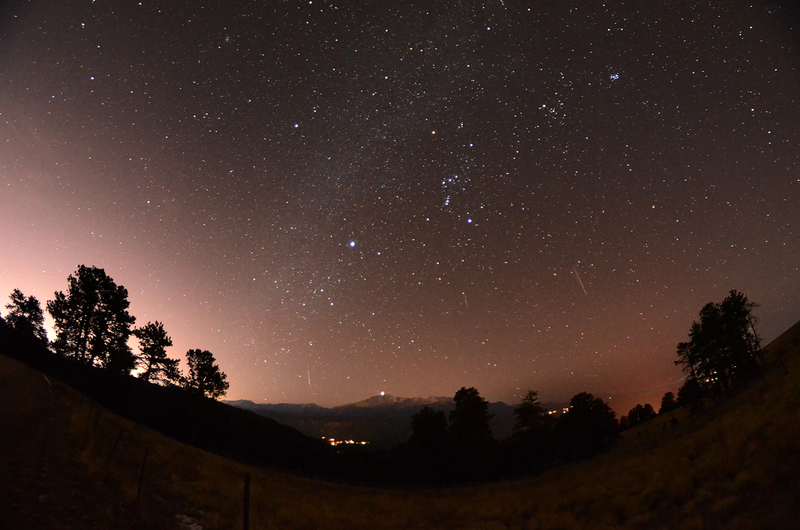 But the parent of the Geminid meteor shower is a mysterious body named 3200 Phaethon. This solar system object is termed an Apollo (near-Earth) asteroid, and it might be a dormant comet. How does that help you watch the shower? It doesn’t. But it’s fun to contemplate on a dark night under the stars. 8. Bring along a buddy. Both of you watch different parts of the sky. If one of you sees one, shout out “meteor!” Again, don’t worry about which direction to look. Just let your eyes rove casually in all parts of the sky. 9. Special equipment? Not necessary. You only need a dark sky, a reclining lawn chair and the warmth of a sleeping bag. A hot drink and a snack can also be good. 10. Enjoy nature. As a wise man once said, meteor watching is a lot like fishing. You go outside. You hope you catch some! 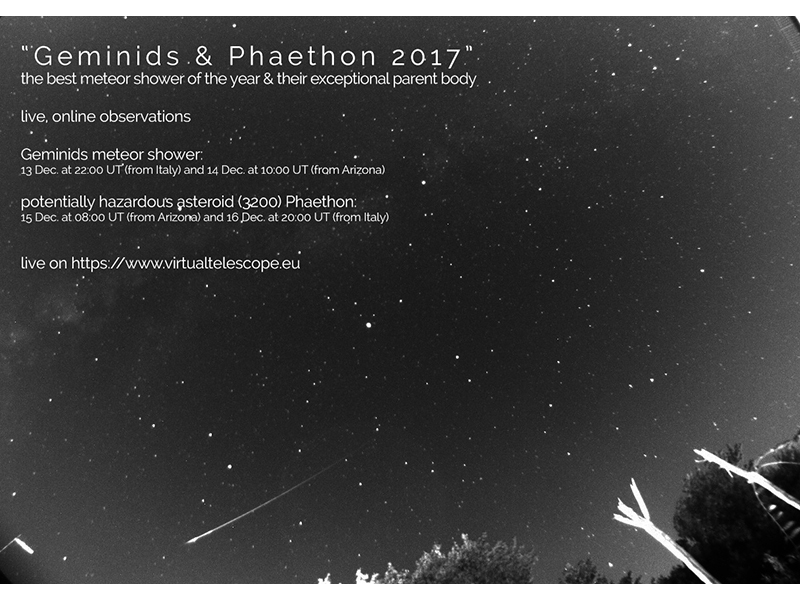 The Virtual Telescope Project will be offering online viewing this year of both the Geminids and 3200 Phaethon. Check out the times listed in the poster above. Click here to translate to your time zone. Click here to go to Virtual Telescope Project’s site. 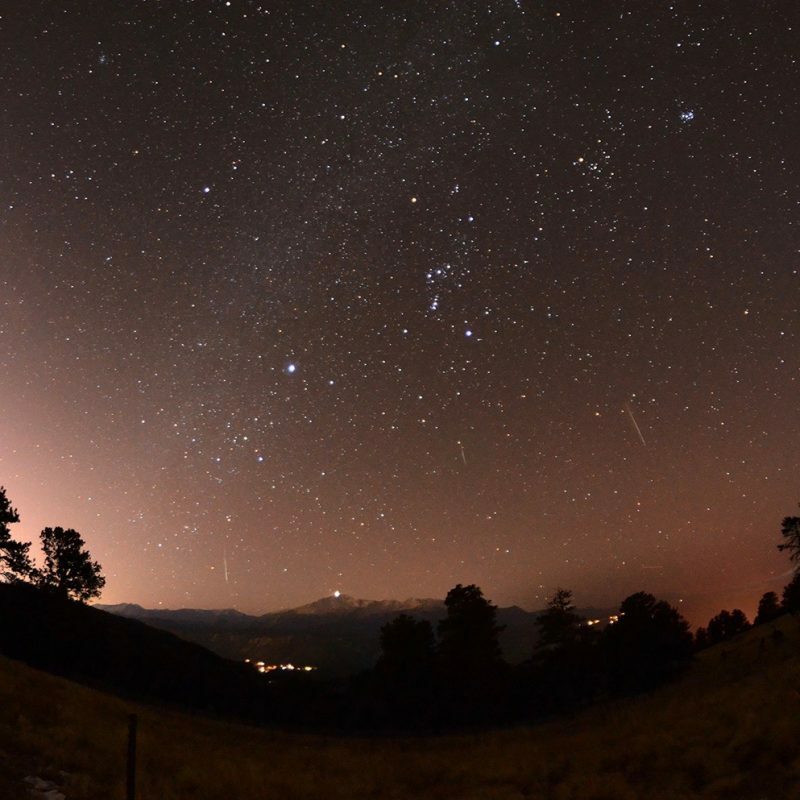 Bottom line: We anticipate on 2017 being a good year for the Geminid meteor shower! Here are 10 tips for watching the shower.